The Commonwealth of Puerto Rico has produced 257 major-league baseball players, including Hall of Famers Roberto Clemente, Orlando Cepeda, Roberto Alomar, and Ivan Rodriguez. Although the list of Puerto Rican-born players is long and impressive, no other player from the islands has hit more home runs than Carlos Delgado. During a 17-year career with the Toronto Blue Jays, Florida Marlins, and New York Mets, Delgado slugged 473 home runs and accumulated 1,512 RBIs. Carlos Juan Delgado Jr. was born on June 25, 1972, in El Prado section of Aguadilla,1 Puerto Rico, to Carlos "Cao" Delgado and Carmen Digna Hérnandez.2 Both his father, "Don Cao," and his grandfather, Asdrúbal "Pingolo" Delgado, were well-known figures in the town. Carlos’s father was a drug and alcohol counselor while his mother worked as a medical laboratory assistant. Like many young boys growing up in Puerto Rico at that time, Carlos’s boyhood hero was Roberto Clemente. Having both parents employed in social- and-human service jobs and a hero like Clemente undoubtedly had an impact on Carlos’s development as a social activist and his deep commitment to social justice and charitable work in his adult years. Carlos attended Agustín Stahl Middle School and José de Diego High School in Aguadilla.3 After his junior year of high school, the Texas Rangers, New York Mets, Montreal Expos, Cincinnati Reds, and Toronto Blue Jays all expressed an interest in signing Delgado. Ultimately, the 16-year old catcher signed with the Blue Jays primarily because he felt the organization, which had become a perennial contender, had an established track record of developing young talent from the Caribbean, including Blue Jays greats George Bell and Tony Fernandez, both of whom hailed from the Dominican Republic. While Carlos’s parents recognized their son’s athletic ability when he was still young, the Delgados placed a high value on education. His parents fully supported their son's desire to pursue his dream to play professional baseball, but only if he had a backup plan in the event he failed. Delgado’s deal with the Blue Jays included a $90,000 signing bonus and a promise that the team would pay for his college education if he ever decided to pursue one. That was all his parents needed to hear. Following his success at St. Catharines, Delgado began the 1991 season with the Myrtle Beach Pelicans of the Class-A South Atlantic League. In 132 games he hit .286 with 18 home runs and 70 RBIs. While the Blue Jays were impressed enough with his bat to promote him to the Triple-A Syracuse Chiefs as a late season call-up, his defensive skills were not progressing as quickly. He committed 19 errors behind the plate for the Pelicans. Delgado continued to advance through the system and spent the 1992 season with the Dunedin Blue Jays of the Class-A Florida State League. There he had a breakout year that cemented his status as a top prospect. The left-handed-hitting catcher had grown to 6-feet-3, is listed as weighing 215 pounds, and topped the circuit in nearly every offensive category including hits, doubles, home runs, slugging percentage, on-base percentage, and runs batted in. He finished the year with a .324 average, 30 home runs, and 100 RBIs. After his outstanding year at Dunedin, Baseball America pegged Delgado its number-4 overall prospect entering the 1993 season and the Puerto Rican backstop was promoted to the Knoxville Smokies of the Double-A Southern League. He was the Smokies’ primary catcher and hit .303 with a Southern League-leading 25 home runs and 102 RBIs. At this point the Blue Jays continued to see Delgado as the eventual successor to catcher Pat Borders and called him up to Toronto when the rosters expanded in September. On October 1, 1993, at Camden Yards in Baltimore, Delgado made his major-league debut when he entered the game as a defensive replacement for catcher Randy Knorr in the bottom of the sixth inning. In the top of the eighth he made his first major-league plate appearance and drew a one-out walk off Orioles right-hander Todd Frohwirth. Two days later, in the final game of the season, Delgado made his only other appearance of the year when he pinch-hit for future Hall of Famer Paul Molitor in the top of the eighth inning. Delgado ended the inning with a pop fly to shortstop. Delgado earned a roster spot with the Blue Jays in the spring of 1994, and in an effort to get his bat into the lineup, manager Cito Gaston inserted him in left field. His success was immediate and the power he demonstrated turned lots of heads in Toronto. In his first 13 games Delgado belted eight home runs and drove in 18 runs. Among his home runs were a pair of majestic shots, the second of which banged off the window of the Hard Rock Café in right-center field. The homer, estimated to have traveled 445 feet, was one of the longest ever hit at the Sky Dome.6 Delgado’s early success was short-lived and he managed to hit only .183 with one home run and six RBIs in his next 30 games before being optioned to Syracuse. Delgado split the 1995 season between Toronto and Syracuse. He started the season in the Blue Jays lineup but was mired in a slump that left his batting average at .154 after 14 games and he was once again optioned to Syracuse. He continued to demonstrate that he could handle Triple-A pitching. In 91 games with Chiefs he hit .318 with 22 home runs and 74 RBIs. It was during this time that Delgado’s transition to first base began in earnest. He returned to the Blue Jays in September and played in 23 games during the final month of the season. Despite hitting only .169 during this stretch, he continued to get valuable experience in the field. His days as a catcher were behind him. After a 56-88 fifth-place finish in 1995 (AL East), the Blue Jays World Series championships of 1992 and 1993 were fading in the distance of the rear-view mirror. Delgado, who earned a spot as the Jays’ primary designated hitter during spring training, was among a cast of younger players that included Shawn Green, Alex Gonzalez, and Tomas Perez whom the Jays attempted to blend with an aging nucleus to bring the club back into contention. During his first full season in the majors, he established himself as an integral part of the Jays’ future plans. He finished the 1996 season with a .270 average, 25 home runs, and 92 RBIs. Delgado always had raw, natural power and a knack for hitting long home runs. Just as he had done in April of 1994, he displayed his immense power in a July 6, 1996, tilt against Detroit at venerable Tiger Stadium. In the top of the third, Delgado cleared the right-field roof and deposited a 2-and-1 offering from Omar Olivares onto Trumbull Avenue — the 29th player to clear the grandstand at Tiger Stadium.8 He later added a three-run blast to deep left field to lead the Jays’ 15-0 rout of the Tigers. While Delgado was a professional’s professional on the field, baseball did not define who he was as a person. According to teammate and close friend Shawn Green, “What separates him from other superstars is that he doesn’t have a big ego.”10 This was evident when Delgado volunteered to surrender his number-21 jersey in deference to then three-time Cy Young Award winner Roger Clemens, who had signed with the Blue Jays in December of 1996.11 The change in uniform number did little to slow Delgado’s development as a rising star. While his batting average dipped slightly to .262 in 1997, he had 20 more extra-base hits than in the previous season and by the end of the year was the Blue Jays’ everyday first baseman, filling the void created when John Olerud was traded to the New York Mets during the previous offseason. The 1997 season was the first of 10 consecutive seasons in which Delgado hit 30 or more home runs — a feat that as of 2017 put him in a select group with only five other players. The 1998 season marked the beginning of six consecutive seasons in which Delgado drove in 100 or more runs and solidified his spot as a bona-fide superstar. During this six-year stretch, he compiled a .295 average, hit 237 home runs, and drove in 741 runs, with a .585 slugging percentage and .998 OPS. In 1999 he hit a career-best 44 home runs. His two finest seasons came in 2000 and 2003, the years he made his two All-Star Game appearances. Delgado entered the 2000 All-Star break with a .363 batting average, 28 home runs, and 80 RBIs. He was a legitimate Triple Crown candidate when he made his All-Star Game debut at Turner Field in Atlanta. He entered the game as a defensive replacement at first base in the bottom of the fourth inning and later doubled off Astros’ All-Star right-hander Darryl Kile in the top of the sixth inning. After the All-Star break he hit only 13 home runs the rest of the season. He finished the year with a .344 average, a league-leading 57 doubles, 41 home runs, 137 RBIs, .664 slugging average, and 1.134 OPS — one of the greatest offensive seasons in Blue Jays history. He finished fourth in AL MVP balloting behind Jason Giambi, Frank Thomas, and Alex Rodriguez. The 2003 season was another All-Star- and MVP-type year for Delgado. Unlike his initial All-Star Game appearance, he started the 2003 midsummer classic, held at U.S. Cellular Field in Chicago. In his first at-bat he flied out to left field to end the bottom of the first. In the bottom of the third he lined a single to left off Philadelphia southpaw Randy Wolf to drive in Ichiro Suzuki with the game’s first run. In his final at-bat, he struck out swinging to end the fifth inning. While Delgado continued to pile up All-Star-caliber numbers, he never again played in another All-Star Game. On September 25, 2003, Delgado became the 13th major-league player in the modern era to hit four home runs in a single game.12 He hit a three-run home run in the first inning off Jorge Sosa, the 300th of his major-league career, and then touched Sosa again to lead off the fourth inning. Delgado hit his third home run off Joe Kennedy while leading off the sixth. His fourth was the most impressive, a towering blast off Lance Carter that landed above the Sky Dome’s restaurant in right center. Delgado’s effort was distinguished from the 12 previous four-home-run games (and the subsequent one) by the fact that he was the only player to hit four home runs with only four plate appearances in the game.13 He finished the 2003 season with a .302 average, 42 home runs, and a major-league-leading 145 RBIs. The effort earned Delgado a second-place finish to Alex Rodriguez in the AL MVP Award voting. At this point a veteran of 11 major-league seasons, Delgado was one of the most respected players in baseball. When the United States invaded Iraq in March of 2013, he decided he was unable to publicly support the US military action. Delgado stood for ''God Bless America'' through the 2003 season but as the 2004 season opened, he vowed not to do so.14 In an act of a simple protest against the war, Delgado chose to remain in the dugout while ''God Bless America'' was being sung. This was not the first time Delgado had expressed his political views. A year earlier he publicly opposed the US Navy's use of the Puerto Rican island of Vieques as a weapons-testing ground.15 On the field Delgado had an injury plagued “off year” in which he finished with a .269 average, 32 home runs, and 99 RBIs. Miami seemed like the perfect fit for Delgado. He liked the idea of playing in a city with a large Spanish-speaking fan base and for a team that had a strong young pitching rotation. With Juan Pierre and Luis Castillo hitting in front of him and Miguel Cabrera offering protection behind him, it seemed as though the Marlins were poised to make a run at a third World Series title. The 2005 season did not unfold as the Marlins planned and they finished tied for third, seven games behind the NL East champion Atlanta Braves. Delgado was a $4 million bargain for the 2005 season. He hit .301 with a team-leading 33 home runs (tied with Cabrera) and 115 RBIs. The Marlins were acutely aware that Delgado’s salary was set to quadruple over the next three years and frustrated that they were unable to put together a deal to finance a new ballpark. On November 24, 2005, the Marlins sent Delgado and the remaining $48 million of his contract to the New York Mets for first baseman Mike Jacobs, pitching prospect Yusmeiro Petit, minor-league utilityman Grant Psomas, and $7 million.18 In acquiring Delgado, the Mets were filling a dire need at first base and bringing in a veteran clubhouse presence. From his perspective, he was happy to be joining fellow Puerto Rican Carlos Beltran on a team that had the ability to contend. The Mets’ new first baseman enjoyed another solid season in 2006, his first year in New York. On August 22 he eclipsed the 30-home run plateau for the 10th consecutive season and hit his 400th career home run when he slugged two homers off the Cardinals’ Jeff Weaver. The second, Delgado’s 400th, was a fifth-inning grand slam. Delgado batted .265 with 38 home runs and 114 RBIs during the season and along with Beltran and David Wright (who both drove in 116 runs) led the charge that ended the Atlanta Braves’ 14-of-15-year stranglehold on the NL East. After 1,711 major-league games, Delgado was finally headed to the playoffs. The Mets easily dispatched of the Los Angeles Dodgers in the Division Series. Delgado led the way in Game One, going 4-for-5 with two RBIs, including a solo home run off Derek Lowe in the fourth inning and a run-scoring single off Brad Penny in seventh. The Mets held on to win the game, 6-5, and went on to sweep the Dodgers in three. Delgado hit .429 in the series. The Championship Series against the Cardinals was an epic seven-game encounter. Delgado had a feast-or-famine series. He batted .304 with three home runs and nine RBIs over the course of the series, but all three home runs and nine RBIs came in just two games. He hit a pair of home runs off Cardinals right-hander Chris Carpenter as he drove in four runs in Game Two, and added his third home run and five RBIs in Game Four. Ultimately, the Cardinals won the NLCS and went on to sweep the favored Tigers in the 2006 World Series. In 2006 Delgado was recognized for his humanitarian and charitable efforts when he was given the Roberto Clemente Award. Over the years Delgado has been true to his hero’s legacy. He has assisted Puerto Rico’s youth through his nonprofit organization Extra Bases, participated in initiatives to improve the islands’ public-education system, visited hospitalized children, and donated video-conferencing equipment to the local hospital in Aguadilla. Delgado got off to a slow start in the 2007 season. He ended the month of April with a .188 average and was still sitting at .227 with 12 home runs and 44 RBIs as June ended. He did find his stroke during the second half of the season but his power numbers were down. From July 1 on Delgado batted .297 and finished the season at .258 with 24 home runs and 87 RBIs. Perhaps the sole highlight of the first half of his season came on May 9 when he took the Giants’ Matt Morris deep and hit a home run into San Francisco’s McCovey Cove. The 2008 season was a bounce-back year for Delgado. He played in 159 games, his most since 2003. His power returned as he belted 38 home runs and drove in 115 runs. All indications suggested that the first baseman was healthy and had returned to form. As expected, the Mets exercised their $12 million option for the 2009 season. Unlike previous springs, Delgado started the 2009 season hitting well. In his first 26 games he hit .298 with 4 home runs and 23 RBIs before his season was cut short by a hip injury. On May 18 the Mets announced that Delgado required surgery to remove a bone spur and a torn labrum in his hip.19 The prognosis was that he would be out for approximately 10 weeks and the Mets expected him to return in July to resume his quest to join the exclusive 500-home-run club. However, Delgado was unable to return during the 2009 season and he filed for free agency in November. Delgado experienced a setback while playing winter ball in Puerto Rico and had a second hip operation in February 2010. In August of 2010 he signed a minor-league contract with the Boston Red Sox. He played five games with the Pawtucket Red Sox before aggravating his hip once again. A short 16 months earlier, it seemed certain that Delgado was destined to hit 500 home runs. Now his career was over. As of 2017 Delgado resided in his hometown of Aguadilla, Puerto Rico, with his wife and two children. He enjoyed keeping a low profile, spending time on the computer, listening to music, watching movies, and enjoying his cigars. This biography appeared in "Puerto Rico and Baseball: 60 Biographies" (SABR, 2017), edited by Bill Nowlin and Edwin Fernández. 1 Aguadilla was first made famous by Christopher Columbus, who landed there on November 19, 1493, on his second voyage to the New World. Delgado's hometown is located on the island's northwest coast, about two hours from the capital city of San Juan. 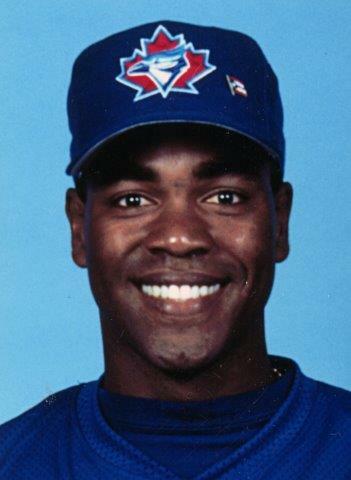 4 “Carlos Delgado, What They Say,” http://jockbio.com/Bios/Delgado/Delgado_quotes.html. 5 Each year, the Toronto Blue Jays organization, with consultation from their minor-league coaches, bestow the R. Howard Webster Awards to the MVPs of each minor-league affiliate. 6 “Jays Rookie Hits Restaurant Again,” Pittsburgh Post-Gazette, April 6, 1994: D-4. 7 “Carlos Delgado: My Say,” http://jockbio.com/Bios/Delgado/Delgado_mysay.html. 8 “Blue Jays 15, Tigers 0,” apnewsarchive.com. 11 Roger Clemens went on to win the Cy Young Award an unprecedented seven times. 12 Bobby Lowe of the Boston Beaneaters (May 30, 1894) and Ed Delahanty of the Philadelphia Phillies (July 13, 1896) both hit four home runs in a single game in the nineteenth century. 13 Shane Tourtellotte, “Holland and Granderson,” April 20, 2012, hardballtimes.com. 14 William Rhoden, “Sports of the Times; Delgado Makes a Stand by Taking a Seat,” New York Times, July 21, 2004. Retrieved from nytimes.com. 16 “Carlos Delgado Weighs Options; Former Tiger Clark Picks Diamondbacks,” Argus-Press (Owosso, Michigan), January 25, 2005: 10. 17 “Delgado Inks Deal with Marlins, Seattle Times, January 25, 2005. 18 Associated Press, “Marlins Seal Deal, Trade Delgado to Mets,” November 25. 2005. Retrieved from espn.com. 19 Anthony DiComo, “Delgado Has Surgery; 10 Weeks to Recover,” May 19, 2009, http://m.mets.mlb.com/news/article/4814480. 20 Jayson Stark, “Delgado Deserved Better in HOF Voting,” January 8, 2015, espn.com. 21 Brendan Kennedy, “Carlos Delgado Shut Out of the Baseball Hall of Fame,” Toronto Star, January 6, 2015.